Isla and her parents have newly moved to the Orkney Islands from Edinburgh hoping a fresh start will help them cope with the recent loss of Isla’s younger brother Corey. They scatter petals in the sea, one for each year of his life and name the rock they stand on after him. Isla finds it hard to cope with her own grief and that of her mother who has become so distant towards her. She is reluctant to be the new girl at school even with the novelty of a daily walk along the shore, she will have no friends there and everyone will know about her loss. 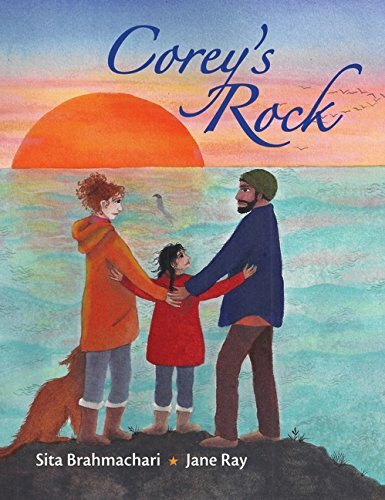 Isla seeks refuge in Selkie stories, told by her father and discovered at the library, these folk tales and reports of shipwrecked refugees past and present merge in her mind with her memories of Corey to create dream like sequences where she meets her brother. With time things change, Corey makes a friend, her mother rediscovers the joy of her previous job as a midwife and the cycle of life continues with a new birth, a child named after the brother Isla has lost. This is a moving and beautifully written story about grief and coping with change. It includes mystical references to magical creatures and hints of reincarnation. The illustrations perfectly complement the text, evoking both the island setting and the dream like sequences beautifully.